Screen grab of purported Islamic State video threatening terror attack on Washington, D.C. Video authenticity has not yet been independently confirmed, Nov. 16, 2015. As investigators and intelligence agencies try to unravel the plotting behind the bloody attacks in Paris, there is growing evidence the Islamic State terror group has been able to extend some degree of command and control well beyond the borders of its self-declared caliphate. Western officials caution they are still trying to determine how much, if any, communication may have taken place between the Paris attackers and Islamic State officials in Iraq and Syria. But they caution the group — also known as ISIL, ISIS and Daesh — has long coveted such capability. The high degree of sophistication required to pull off the simultaneous attacks at the football stadium, the concert hall and the restaurants has others convinced that Islamic State is at least getting very close. "The Paris attacks were not simply inspired by ISIS, but rather they appear to be ISIS-planned and -directed," former U.S. National Counterterrorism Center director Matthew Olsen warned Wednesday. 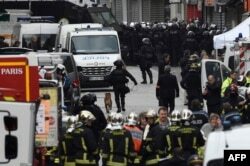 Firefighters and police are gathered in the northern Paris suburb of Saint-Denis on Nov. 18, 2015, as special forces raid an appartment, hunting those behind the attacks that killed 129 in the French capital last week. Those attacks include last week’s twin bombings in Beirut, which killed more than 40 people, and last month’s downing of a Russian passenger plane over the Sinai Peninsula. Data compiled by the Homeland Security Committee suggest, in all, Islamic State has been in some way responsible for more than 60 terror plots against Western targets, including 18 in the United States. And even if Islamic State lacks what would traditionally be considered “command and control,” former counterterror officials like Olsen caution the group has an “unprecedented ability to communicate with its followers worldwide" by using a variety of social media platforms. It is that ability to mobilize potential operatives, specifically former foreign fighters, that has drawn increasing concern. Officials believe the suspected mastermind of the Paris attacks, Abdelhamid Abaaoud, had recently been in Syria. “The Paris attacks confirmed our worst fears — that of the thousands of foreign fighters who've gone to Syria and Iraq to join ISIS, some would be deployed to bring terror back to the West,” said Republican Representative Mike McCaul, who chairs the Homeland Security Committee. "Some have already returned battle-hardened and prepared to strike." Armed police guard a street in Brussels on Nov. 16, 2015. U.S. officials estimate that perhaps more than 5,000 Western passport holders have traveled to Syria and Iraq to fight. And a recent study by the New America Foundation think tank suggests more than 80 percent have joined Islamic State. Intelligence officials are reluctant to say how many Western foreign fighters have successfully returned home, though CIA Director John Brennan said earlier this week there are enough to pose a substantial challenge for Washington’s European partners. “Their ability to monitor and surveil these individuals is under strain,” Brennan said. That key Islamic State leaders would want to put homebound foreign fighters to use, and be capable of success, should come as no surprise, according to current and former officials. “We were distracted by the low-hanging fruit of the [Islamic State]-inspired attacks,” ex-security and counterintelligence operative Mubin Shaikh told VOA via Skype. Shaikh, who has worked with Canadian officials to infiltrate extremist groups, said Islamic State leaders have long been threatening to use foreign fighters for attacks in their home countries. 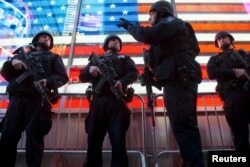 Armed New York City police officers with the special operation division Strategic Response Group stand guard in Times Square in New York, as security was tightened following the deadly attacks in Paris, Nov. 14, 2015. A U.S. official, speaking on the condition of anonymity, also said that it was “not unexpected” that Islamic State would try to carry out a major attack like it did in Paris. “In order for ISIL to maintain their narrative, they’ve got to have something positive happen,” the official said, adding the group’s attempts to carry out more such attacks would only increase as a variety of U.S.- and coalition-backed forces continue to gain ground in both Iraq and Syria. But forcing Islamic State to change its focus or shift its resources to more traditional terror activities comes with a risk. “The more foreign fighters return, the more deadly and capable the attacks can be, because they bring with them training, better links for command and control,” said David Sterman, a research associate at the New America Foundation. U.S. intelligence officials also worry that returning Islamic State fighters may try to use their skills to train and recruit would-be jihadists who were not able to get to the fight in Syria and Iraq. One official noted Islamic State has also shown the ability to “peel off members of other extremist groups,” further bolstering its numbers in the West. But some caution that while Islamic State has shown an ability to reach into Europe with its fighters, experts like the New America Foundation’s Peter Bergen say reaching into the U.S. will be much harder. “ISIS-inspired violence will pose the most likely threat to the United States, not people who are trained by ISIS coming back here,” Bergen said.